You guys must be wondering why I name my MOC this way this time around (no its not related to Xmas) . Ah well I reckon that what you will be seeing below will need no introduction to Transformers fans, I guess I shall skip the formality of implicitly qouting his name. And oh yes... a lil favor: Do play along with me. If you were to post any comments , don't mention the 'bot which Im homaging shall we? great! Well after showing my friend the photos of this MOC for the first time , he mentioned that this RWB I meant to homage be actually looked another RWB character from the same series.. well the jet mode that is. Perhaps it's the general shape of the jet mode which sways towards the other RWB he implied. Still not confused? Great! This MOC has half the work done for me the very first hour I started to build it. I just copy the leg design from my previous MOC, Misfire . But as I go long building the remaining half , I noticed that the leg design doesn't quite cut it. So it's rebuilt again to resemble a more realistic jet back, the tailfins positioning and all. If you compare Misfire's feet with this one, the front feet-backheels design were swapped coz this decision seems to offer better stability. Hence I finally can managed to snap even more photos of him in unique "outrageous" poses. Wrestled with the idea of making a bigger "null ray" rifles (like the G1 toy) but it looked ridiculous in both modes . Sometimes simplicity is bliss , so I finally making them 1 brick thick and using just 5 parts each side I think. I decapitated Misfire's head and modified it to be used for this MOC. hehhe..
OK.. let's move on to the photos.. In this final month of the year, I'm lowering my gear and taking it easy, work-wise. Thanks to my state-only public holiday (King's birthday) today.. I am able to have a day off to chill. After some fun MOC-ing since last Thursday... I almost forgot I have one more "obligation" to fulfil... which is posting this entry. Razorclaw , the leader of Predacons, is a mecha-Lion, and forms the body for combiner Predaking. And let's move to the leader ,Razorclaw.. shall we? Misfire is a targetmaster Decepticon binary bonded with Aimless , a nebulan "human-like" companion that transforms to become his rifle. Although he often misses than hits... as long as he's firing on everything and anything in the battlefield, he's worthy enough to serve as a Decepticon,so they said. I don't usually post updates on my WIP (work in progress) because I'm a person of few words. So its pretty hard for me to describe my WIP in details and would channel most of my free time to keep on building and building. And I don't think many would be interested to know my WIP details either. And usually let the photos do the talking and that usually means the finalization of my MOC. 24 hour per day aint enuff for me! I'm in the news again with article pertaining to the firm I'm working in (or to be precise.. a very ambitious e-learning online game). The already mounting pressure is hitting boiling point. Before I forget that I actually have a blog to update, let me just dump a bunch of Divebomb instructions here. I'm late I'm late I'm late so sorry for being behind schedule............! I can't believe time flies. I spent the last 2 weeks working everyday (and every other nights) and things have been shifted to high gear when a local press covered some projects in my firm , and the article was published. I'm helming the programming part of this ambitious web project which is a nightmare to code indeed. (and the constantly ringing phones simply threw my focus away. [Note to self: ask boss to provide soundproof room for me in the future] ). Ok thats enuff ramblings for now. I think I'll stop now with my mild "rampaging". I make it a point to update my blog with new entries at least once a fortnite.. but for Predaking Instruction... once a week to keep the momentum going. However... work got the better of me (I wear many, many hats in the firm I'm working). It's Saturday morning when I'm preparing this entry. Afterward I'll be zipping off to work again to rush for the all important deadline. New here? Click below to view Part 1 first. Part 2 here I come! As you know few posts back , I mentioned about recovering some important files thought to be long lost after my hard disk died. Yes. I found the whole stash of LEGO Predaking building instructions files!! 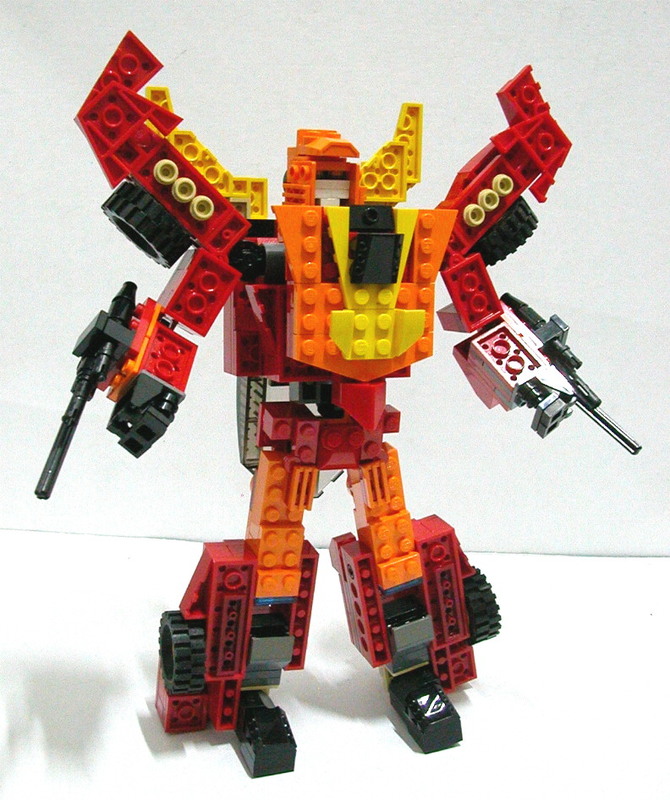 I shall start the ball rolling by showing building instructions for Headstrong, the left leg for Predaking. Ready? In my early years of MOCing... I set sight on building Snapdragon because he's one of my favorite Transformers Triple Changer. Back then, I didn't have much parts to get started, so that MOC end up having different color than it's original toy (below). So the time have come for me to improve him because I can't bear to see him in yellow anymore. In the original toy, Snapdragon is a Headmaster triple changer that transforms between a jet , dragon and finally a robot. The headmaster companion is a minifigure that transform into Snapdragon's robot head and beast head as well. However, due to issues pertaining the head-size ratio , I've decided to build him not as a headmaster Transformer, but maybe his incarnation from "Fall of Cybertron" era. For those who wanted to see nothing but photos and more photos.. you have come to the right place. Let's go! Once upon a time... I took my first step in documenting my LEGO-formers instructions by developing a custom web application to assist me in quickly pinpointing each part needed and store the info in a database, so that parts list can be generated to accompany each instruction images (or for the whole MOC). While I performed some file organization in my (another) hard disk..I noticed my web app is still there! (I don't remember performing any backup. ah well!) Further discovery exposed the instructions for a few of my favorite past MOCs. This is my first MOC ever to be highlighted in brothers-brick.com. Sometimes I wondered why it gotten so many replies/views in my mocpages.com entry back then , compared to these past few years? Anyway, hope you guys out there can rebuild it and have fun doing so! The "tiny" representation of Hot Rod came from Reissued "Star Convoy" Transformers Toy (Japanese). Read on for the complete instructions.. The first time I saw set 6914 box art (preview) online, it's definitely high in my must-have list . So....I dismantled it after 30 minutes and MOC a mech out of it in about 1 hour. Neo Sunstreaker is a "modernized" version of the original Transformers G1 Sunstreaker toy. This was yet another "impulse" moment when I took my LEGO Technobot Lightspeed for a photoshoot to compile the building instructions (it's here in my blog entry). I noticed that even though Lightspeed was a pretty old MOC of mine , the building techniques involved are pretty versatile. That explains why I'm still keeping him around displayed on my shelf till now. So one fine afternoon... I kicked off Project Neo Sunstreaker based on Lightspeed and its done in less than 10 days! Initially I planned to do a slight retool from Lightspeed, but one thing lead to another.. I ended up re-model the whole MOC almost from scratch. In my overzealous attempt of enhancing him with detailed parts , I applied the grilled 1x2 slope on his thighs. Knee articulation seemed fine the first few times I bent them for posing in 'bot mode , so I though the build was OK . Finally the grilled slopes loosen and popped out after a while. By then I've already snapped most of the photos .It's not really an obvious "fault", but still, Dang ! No matter how careful you finalize your MOC/build for photo session... when things go wrong, THEY WILL. This is the 2nd Transformers MOC I build with an improved neck articulation (the first one being Rodimus Primal ). Now he can tilt his head up and down besides the usual left-right. The original toy came with interchangeable hand / missile launcher thingy on his wrist . I say... why not BOTH ? Decided only to put the red-part on his shoulder as a homage to the original toy since it's not too "intrusive" in car mode (apparently they're tucked in the back of the car and doesn't spoil the paintjob). It's my most solid MOC to date. Transformation doesn't cause parts to fall off easily. Do forgive the lack of details for the torso/waist, coz it's too compact in vehicle mode until can't even fit in a single tile to enhance it. Finally, let's wrap up the instructions with the chest component. For part one, please refer to previous posting. Usually for symmetrical limbs, I just flip the images. This time around, I can't do that since there is a slight difference between both legs. 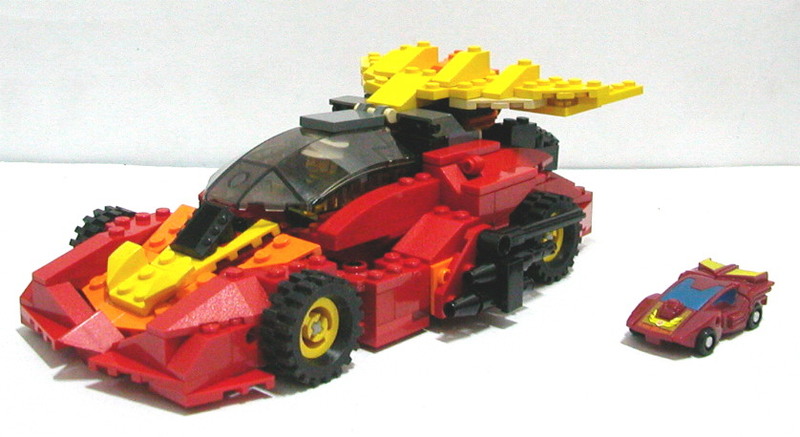 Lightspeed is part of my highly ambitious LEGO combiners project back in 2008 (mocpages entry here). I had dismantled the gang except him and Afterburner: both remained displayed in my living room till today. Before I proceed with the instructions, he deserves a new set of clearer photos. Nearly 3 months ago, I took out Super Soarer (Creator set 6912) and built Interstellar Soarer . In this post, you'll get to view the instructions on how to build it. Note: The original build is different from the instruction below veeeeeery "slightly". But its 99% all the same. Are you ready? Let's go...............! And of coz... in this low-season (a term to denotes a "time gap" after I finished my latest MOC and before I initiated another new project), I would like to take some time to post instruction of Fangpyre bot. For an official photo gallery of Neo Sandstorm, please scroll down (or next page) to view my previous posting. - Fold rotors facing up temporarily. - Raise up (and rotate) cockpit and flaps. Neo Sandstorm is my "reimagining" of an old G1 Transformers triple changers (see below). I once "owned" G1 Sandstorm (its a pass-me-down from a cousin of mine when he outgrown his toys). And I regret NOT keeping it till now (sold it to a fellow transformer fan back in 2005). It's a nifty looking toy and both alternate modes are very solid. Ok, returning back to my MOC , I am basing it on skycrane helicopter, which I've come to admire after seeing recent LEGO sets featuring it (T-rex hunter and Cargo Copter), in which the latter I regret (again) not buying few years ago when I had the chance. *sigh*. As expected, below is the instructions for the Bot-lightyear MOC I did last week from official LEGO Toy Story﻿ Construct-a-buzz set. Sorry for the oversaturated photos (causing white parts to be ambigious) . Don't worry... I have put remarks inside the instruction to let you know whether the part shown is a tile or is a studded plate. Let's start with the head, shall we? Enjoy! I snagged LEGO set construct-a-buzz on the last day of 2011 coz it goes for nearly 50% off the retail price. It never dissapoint in terms of number of hinges, slopes ,wedges and brackets which are very useful for my future MOCs. So the finished model stayed there on my shelf displayed... until today. Before I dismantle the parts to be put into my LEGO "pile" (organised into trays of different part categories and colors) , I decided to squeeze more mileage from this set by trying to build something else out of it. And after nearly 3 hours of fun... this MOC is born! Catch a sneakpeek of this latest project of mine here, primarily focusing on the transformation sequence of a few modes.